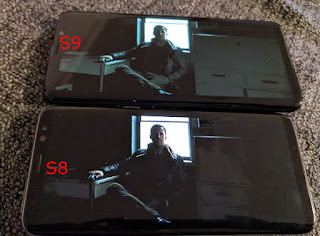 If you own a Samsung Galaxy S9 and you notice when watching movies or shows that the picture becomes smudgy when especially the dark parts of the scenes, well, you're not alone because many have already reported this issue. The problem is being referred to as black crush or color banding. Is it a firmware issue or a hardware problem? Well, we don't know yet but based on the opinions of other owners, it could be just a matter of hardware calibration but some pointed out it could be due to a firmware problem. Samsung actually did roll out an update but it didn't fix the issue at all. What happens is that in Galaxy S9, black doesn't seem to be really black especially when you're in a dark environment. So, if you're watching a movie during bed time, goodbye to having a really good graphic experience. Is it a big deal? Considering the fact that one of the selling points of the Galaxy S9 is its 'efficient AMOLED display' with improved graphics, yes, it is! What you should do if you have this problem is try to update your Galaxy S9 and if the problem continues, then you should bring it to Samsung Experience or Samsung-authorized shop and have it replaced. Whether or not there's a fix to this problem, having spend several hundred bucks to get a premium phone like this, you don't deserve to deal with this kind of problem. So, as early as now, you should already arrange for a replacement because if it so happen that this problem is with the hardware, Samsung may just roll out updates every now and then to put a band aid over the wound rather than a medicine to cure it. I hope that we've been able to help you one way or another. Have a great day!